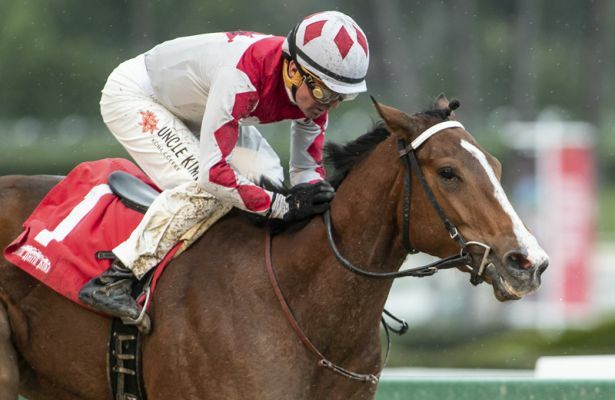 A California-bred daughter of Unusual Heat, KMN Racing’s homebred Apache Princess relished a change in surface from Santa Anita’s hillside turf course to 6 ½ furlongs on a sloppy main track as she rallied up the rail to take the $100,000 Sweet Life Stakes by 3 ¼ lengths. Trained by Keith Desormeaux and ridden by his Hall of Fame brother Kent, Apache Princess got the distance in 1:16.82 despite the fact Kent dropped his stick inside the furlong pole. Originally a Grade 3 on turf, today’s Sweet Life Stakes result will be evaluated by the American Graded Stakes Committee in the coming days to determine if today’s race will retain its graded status.